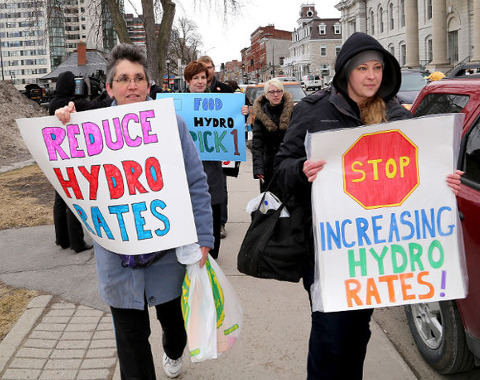 Hydro in Ontario is a mess and rates are skyrocketing. The high number of people who have trouble paying or can’t pay their Hydro bills is growing by the day. Businesses are leaving the province and/or refusing to locate here because of high Hydro rates. A group that is especially being ignored is small and medium business including farmers (that’s from a former union activist!). It’s worth reviewing that history. The most significant piece of legislation affecting Hydro rates was Mike Harris’s Bill 35 in 1998, The Electricity Competition Act . It ended 94 years of public, non-profit, at-cost power in Ontario, where profits were given back to businesses and rate payers in the form of low and stable rates. On April 1st, 1999, all Municipal Hydro’s as well as Ontario Hydro were changed from non-profit, at-cost Commissions into for-profit corporations. Ontario Hydro was broken up into five Corporations, the two largest being OPG (Ontario Power Generation) and Hydro One. The Harris Tories conducted a massive advertising campaign on Hydro Deregulation promising that “A competitive deregulated electricity market, will lead to lower rates” [see “Harris certain Ontario power rates will drop”]. At public hearings then and all through the 2000s, as part of the campaign to maintain public hydro, the question repeatedly asked was “How do you get lower rates when you add in profits to generators, profits to distributors, profits to retailers, dividends to investors and commissions to commodities brokers?” When Tory Energy Minister Chris Stockwell was confronted with this question, he angrily left his own town hall meeting. In 1998, the Conservatives set up a Market design committee. The main player on that committee came from ENRON, an American corporation that had recently committed one of the biggest corporate frauds in American history. It had designed electricity markets around the world including Alberta, California, and here in Ontario. Not surprisingly, Alberta had the same problems with high rates as we came to have here in Ontario. California subsequently had a major crisis with its electrical system after ENRON designed its electricity market and – in order to raise market rates – manipulated supply so low that it resulted in major blackouts. The deregulation that originated in the U.S. was the major cause of the 2003 blackout here in Ontario. Ontario’s electricity market opened in the spring of 2002 but in November of that year Premier Ernie Eves had to close the retail market because the market price had spiked up to 49 times the rate during the summer months. The ENRON designed wholesale market – called the IESO (The Independent Electricity System Operator) remains open to this day and is one of the major reasons for price spikes in Ontario. 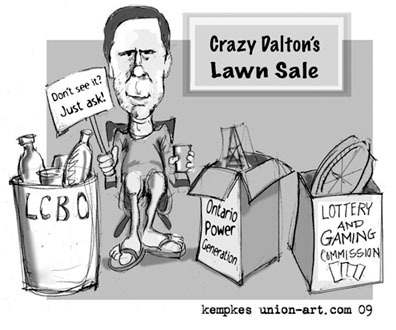 In April of 2002, CEP, CUPE and the Ontario Electricity Coalition stopped the Harris/Eves sale of Hydro One in court. During the court case Judge Gans asked the governments lawyer “Why did you separate the debt from the Bruce nuclear deal?” The Government Lawyer answered. “To make it easier to sell” [the ruling can be found here]. In June of 2002, after losing the court case to sell Hydro One, the Tories under Ernie Eves passed Bill 56 giving them the legal authority to sell Hydro One. But they didn’t dare do it. It is this legislation that Kathleen Wynne is using to sell Hydro One now. (In 2000, in a deal far worse than the sale of HWY 407, the Tories had privatized the Bruce nuclear station via a long term lease. The profits are privatized but the debt, the risks and decommissioning remain public). Tory leader Patrick Brown seems to have amnesia about the Tories’ actions and the Tory deregulation legislation that is the major part of skyrocketing hydro rates. The ENRON designed IESO electricity market however remains open and hidden. The IESO submits a bill to the OEB (Ontario Energy Board), twice a year and the OEB “trues up” rates. That’s why for the last ten years, your Hydro bill has gone up every May 1st and November 1st. There is not an ENRON designed electricity market anywhere in the world where prices have not skyrocketed. In the spring of 2002, part of the NDP’s energy plan was that “All new generation will be private.” (As well, during the early 1990s, Bob Rae’s appointee to head Ontario Hydro, Maurice Strong, was instrumental in laying the groundwork for the restructuring of Ontario Hydro for the Harris Tories). At the convention that year, leader Howard Hampton deleted that part of the NDP’s plan and he campaigned on Public Power in the 2003 provincial election. The Liberals went on to win the election, broke their promise for Public Power, and continued to enact legislation which expanded Hydro deregulation and privatization. They passed Bill 100 in 2004 which changed regulations in favour of more deregulation. That year the Liberals introduced “time of use” pricing and Smart Meters with the promise that “Smart Meters will save you money.” McGuinty also said that Smart Meters were the primary tool for conservation. The Ontario Electricity Coalition said at the time that Smart Meters would not do anything for conservation. All “time of use” pricing and Smart Meters would do is funnel massive profits into the electricity market – a claim confirmed by the Auditor General’s 2014 report on Smart Meters. The Liberals also won the 2007 Provincial election. Despite Public Power being the main campaign plank of the NDP in the 2003 election, the NDP never mentioned a word about Public Power during the entire 2007 election. The Liberals quickly went on to bring in the billion-dollar Integrated Power Supply plan promising more competition and increased efficiencies, and the Green Energy act in which the Liberal Government signed 20 and 30 year contracts with private green energy producers (wind turbines and solar farms) as high as 80 cents a Kwh, which forms the major part of that Global Adjustment Fee. In stark contrast, the price of power in 1998 was 4.3 cents a Kwh. Since then, rates have soared as the Ontario Energy Board basically rubber stamps all applications for delivery (distribution) rate increases. Despite being touted as an independent watchdog, there is a revolving door for employment between the OEB and Hydro companies in Ontario. In Toronto, since 2006, the OEB has approved $6-billion in rate increases with no effective oversight. How is it possible, in this day and age, for the CEO of Toronto Hydro to lie on his résumé (getting paid $1.2-million a year based on credentials he doesn’t have), lie under oath at regulatory hearings, raise rates by $6-billion, put a company $2-billion into debt with no scrutiny, and allow the Institutional knowledge required to run the utility to just walk out the door with no succession plan? When the OEB was presented with iron clad proof of the situation at Toronto Hydro, it did nothing. Meanwhile small and medium businesses and citizens in Toronto suffered. Under deregulation, delivery or distribution charges went from about $6/month to as high as $120 in some rural areas, hitting farmers hard. There is much more to the story especially on the current sale of Hydro One. When the Liberals passed Bill 91 they removed all public oversight of Hydro One in order to make it easier to sell. Once consistent, government response to rates going haywire because of deregulation has been to come in with a rate freeze to “protect” us – without in fact making any substantive change to deal with the underlying problem. Eves did it, McGuinty did it and now Wynne has done it. This latest round of rates freezes does nothing more than protect deregulation and the profits made by private energy producers. Wynne is also financing the Global Adjustment fee which has greatly profited private green energy producers. Refinancing Global Adjustment fees just piles up more debt. Nor did Wynne close the IESO Electricity market. Market debt is also piling up; debt that must be paid by ratepayers… after the election. In short, deregulation and privatization did not deliver on its promises of “lower rates,” or create “greater efficiencies.” Smart Meters did not save you any money. 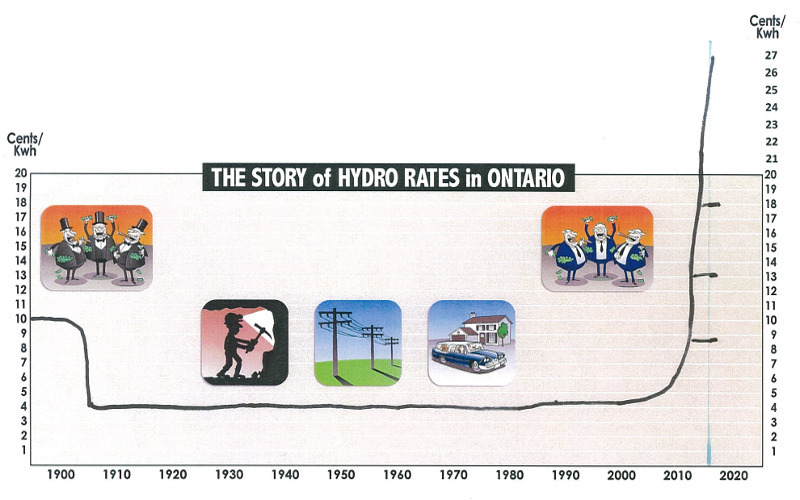 In fact, Hydro deregulation has been a complete disaster for Ontario’s businesses, citizens and its economy. Deregulated electricity markets have not worked anywhere and never forget, the vested interests who profit greatly from the ENRON designed, IESO electricity market here in Ontario with do anything and everything to keep that market open. 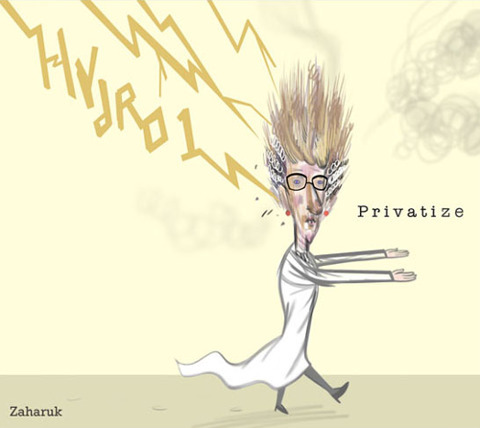 All privatization, mergers and the sale of Hydro One must immediately stop. (European countries like Germany are buying back their utilities. We must make a plan to buy back our Public utilities). Deregulation didn’t work. Period. The IESO electricity market must be closed and deregulation legislation must be repealed. Rates must be regulated. “Time of use” rates must be scrapped and replaced with a single rate. (Smart Meters can still be used for a single rate). 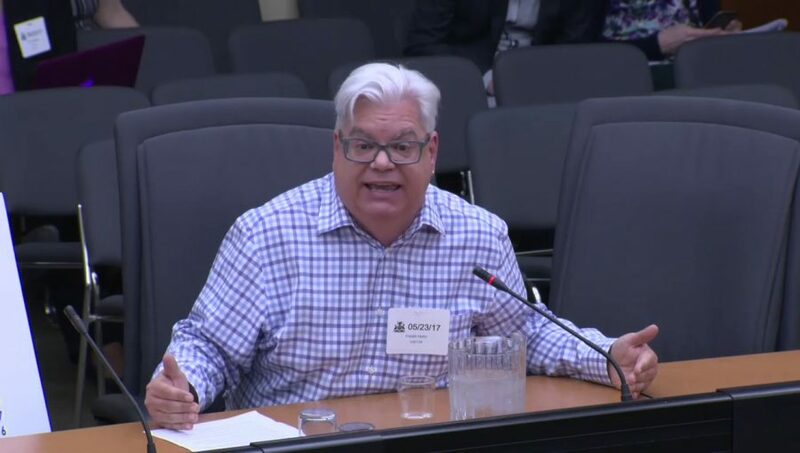 The entire Ontario Energy Board must be replaced and restructured to be a real public and democratic watchdog with real teeth so that it acts in the public interest not for the private few. A review should be conducted on the OEB’s decisions on delivery and distribution charges and some of the more glaring conflicts of interest. is never going to do what needs to be done. It is ten times cheaper to use less power than build new generation of any kind. Private electricity producers, green or conventional, are however not in the business of selling less power. There have been no real conservation measures under deregulation. In order for Green power such as wind and solar to be successful, it must be owned locally, cooperatively and benefit the local community, not profit driven multinational corporations. The private sector does its job of making and manufacturing all the things we need for a Hydro system, wire, transformers, switches, poles connectors, relays etc. But – driven by their commitment to maximize profits for their shareholders – they do a terrible job of acting in the public interest. That’s the dividing line between public and private in the hydro industry. Those long term agreements for private wind and solar power will have to be dealt with. This will be one of the most difficult issues. They will sue under NAFTA (As some of us predicted in 2002). Make a plan and rebuild our public utilities. Ontario’s businesses, jobs for youth, the environment and the economy depend on that to happen. Returning these levers of control to local and provincial governments is critical. The people of Ontario never wanted private, deregulated power. They have always wanted regulated, public power. They now understand that rate freezes just delay the inevitable rate hikes after the election. They are ready to press for a fundamental change in how we deal with energy. Ontario Tory Leader Patrick Brown has amnesia about the history and cause of high Hydro rates and is blaming Kathleen Wynne. Andrea Horwath’s NDP had the right campaign at the wrong time in 2003, but is now silent on Hydro deregulation and the ENRON designed IESO electricity market. Why is that? The NDP spent a ton of money on the Public Power campaign in 2003 and could claim that the NDP was right all along. Why isn’t she doing that?